Unionized Verizon workers who had been striking since mid-April will return back to work this week after negotiating a healthy pay raise and bonus. The union leading the negotiations -- Communications Workers of America -- said workers will receive a $1,250 "signing bonus" and a 3% raise. The deal with Verizon must still be ratified by workers. In total, workers can expect a raise of nearly 11% over the next four years and hundreds of dollars in profit sharing payments, the union said. As part of the deal, Verizon (VZ) also committed to hire 1,400 new employees, with the vast majority set to be based in call centers on the East Coast. "We're especially proud of our commitment to 1,400 new hires -- high quality and well-paying American jobs," said Verizon's chief administrative officer, Marc Reed. Most of the employees represented in the labor negotiations work in call centers and maintain the Verizon fiber optic network, called FiOS. U.S. Labor Secretary Thomas Perez had to intervene as the dispute dragged on. The main sticking points were over complaints about working conditions, call center closures, pensions and jobs getting shipped overseas. 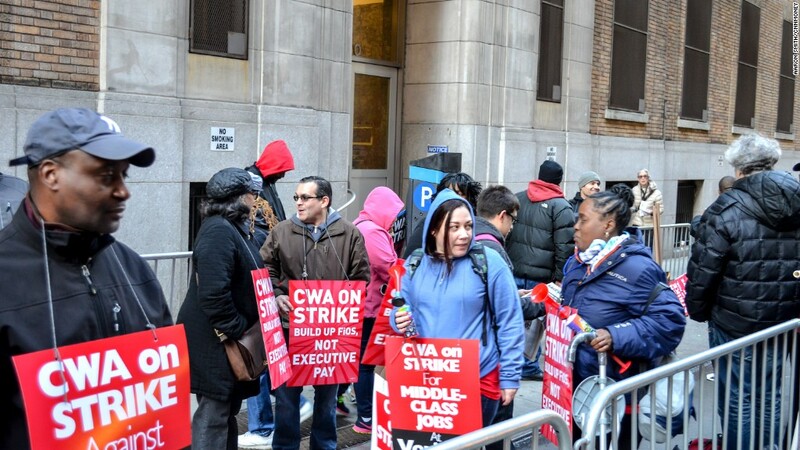 The strike was the biggest in the U.S. since an earlier 2011 Verizon dispute. The labor dispute has taken a toll on Verizon's business. Lowell McAdam, Verizon's CEO, said earlier this month that it's been harder for the company to sign up as many new customers as before the strike began. Verizon stock has also lagged behind the broader market as well as peers AT&T (T) and Comcast (CMCSA). News of an agreement helped send Verizon stock 1% higher on Friday.